Let's talk interrailing! This summer my boyfriend and I packed up our duffel bags and backpacks and mini suitcases and took to Europe's rails. The past three weeks of journey has been absolutely amazing since there have been minor hang-ups, it's safe to say my incessant planning actually worked! This post will take you step by step in what we did before we boarded our first train! 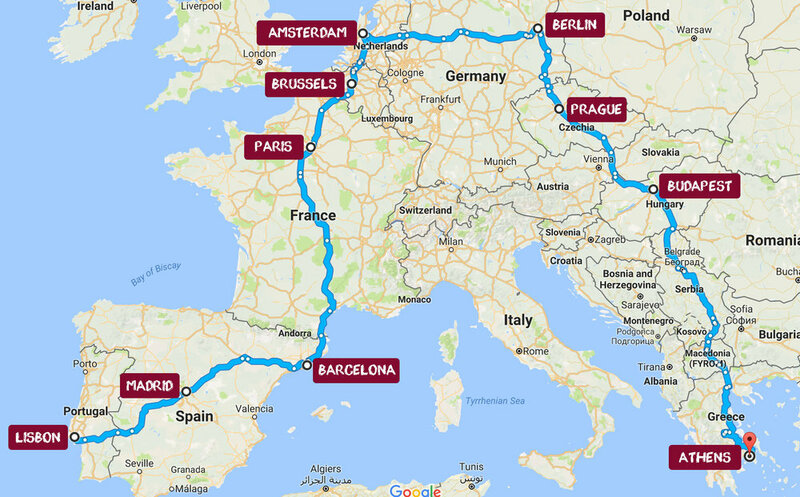 Let's start with what our final route looked like - we started in Lisbon and made our way up and across Europe to end in Athens. Before researching every detail and budgeting our trip, George and I sat together and discussed what our absolute dream trip would be. 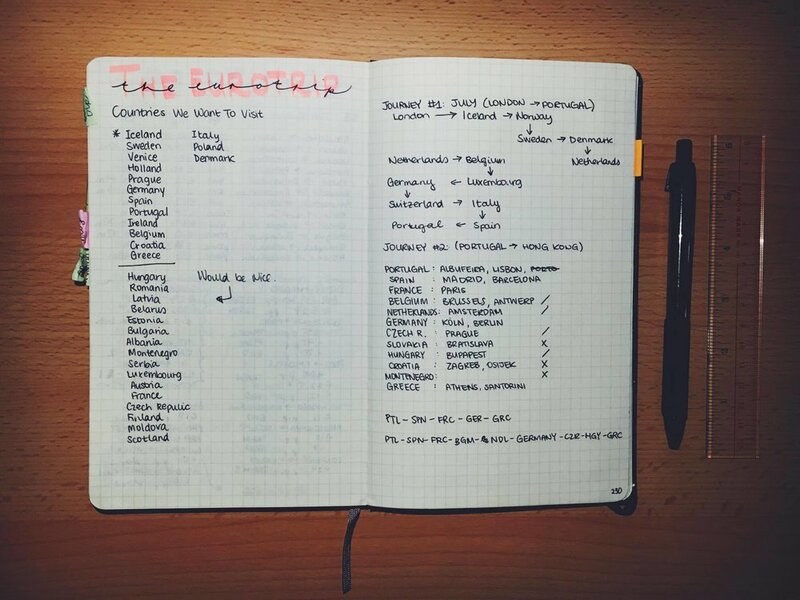 We compiled a list of every single country and city we wanted to visit, dreamed up all the food we could eat, and discussed the perfect accommodation and transport. 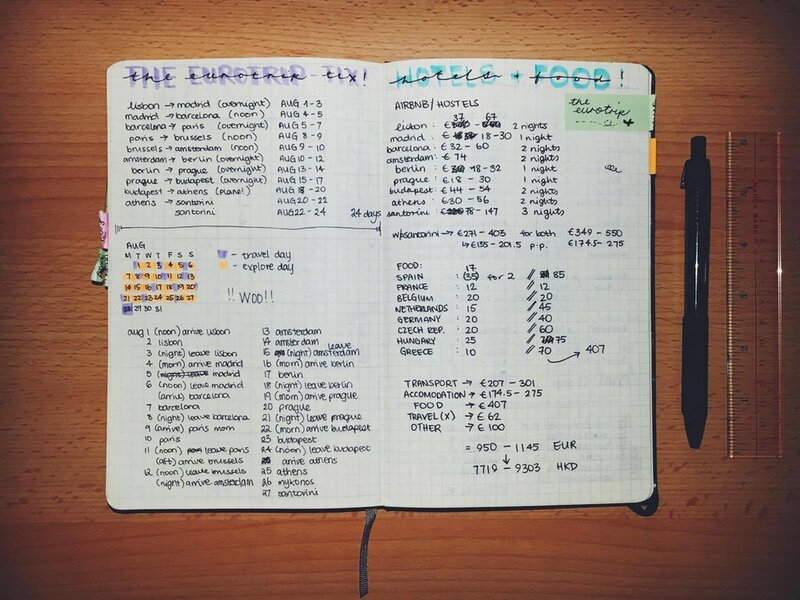 This all helped us figure out what was most important to us for our trip and became a starting point for route planning. This is a step that a lot of guides often miss out, but it really helped in not restricting us from really thinking outside of the box and honing in on what's important. Our dreaming big and whittling down to dreaming realistically! Using the handy interrail map, we looked at the countries we wanted to visit and drew some lines to see what the best route would be that would hit all our countries. This definitely takes some time and compromise - we each had to say goodbye to a place we initially refused to let go of (Reykjavik and Santorini!) Your first route plan, if all goes to budget, can definitely be your final one but be open to change! My research into if it would be better to only take trains or use multiple modes of transport! Your budget will most likely change as you research and figure out what's important to you. For us, most of our money went into food and accommodation. From our initial dream trip, we figured that our priorities lay in having a private room close to city centres and eating! After a lot of research, we settled on AirBnB's for accommodation (max €25 pp/night) and about €25 max/pp for a meal. This is by no means what we've actually spent, but it gave us a good starting point in seeing what we might potentially spend. It was also at this stage where we made minor alterations to our route! After all the daydreaming and research, we just had to go for it! After all the pre-planning, this is when we made it all concrete. 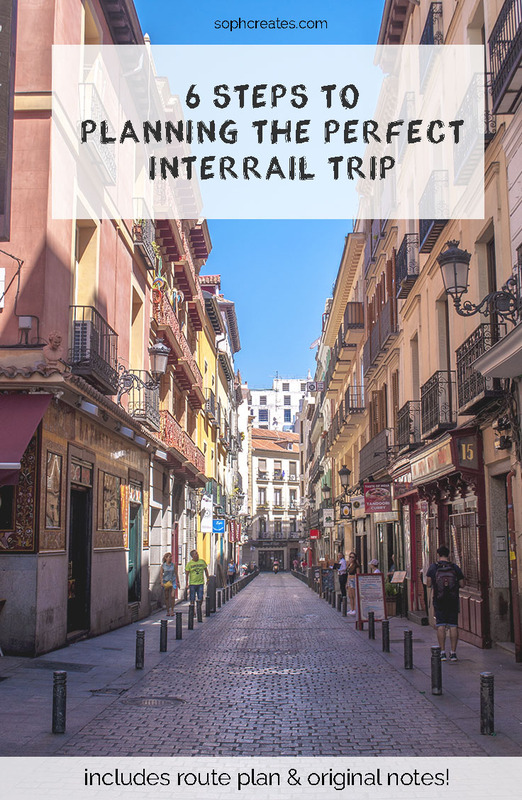 After deciding that our potential budget was doable and stalking many a travel instagram, we booked our interrail tickets! From that point onwards it was just a matter of booking each AirBnB and putting together itineraries for each city. After it's all booked there's nothing left to do but go! Bright eyed and bushy tailed, ready to leave Hong Kong for Portugal! It took us a hefty 6 months to get to step 5, but once it was all booked, it felt amazing. Now, we're on the road and loving (almost) every minute of it. It's definitely been one of the most worthwhile trips I have ever decided to take.